Back in March, I hired a landscaper to make me a garden. 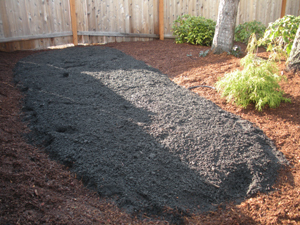 He did this by scraping up the barkdust in the “back 40″ and dumping a load of mushroom compost soil. He said I didn’t need raised beds because the plot had the right drainage profile. 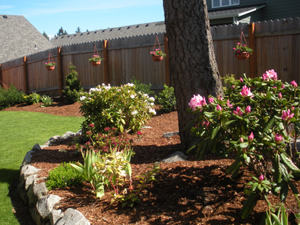 He also modified the sprinklers so they would water the garden bed, and installed sprinklers for each of my hanging baskets. The plot of soil looked like a large grave. I started sprouting tomatoes, peppers, and other plants from seed at the end of March. I wasn’t aware that the real last-frost date here is really May 15, or Mother’s Day at a minimum. So informed, I’ve been sprouting and sprouting but can’t say I’ve ended up with good looking plants. I have already decided not to go this route for 2010. I shall instead just buy plant starts at the farmers markets and other plant sales. 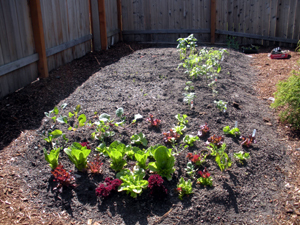 I have been planting the lettuce starts for the past three weeks and eating some of the results. I put them in the front of the garden for easy access. I then have a long row of tomatoes, peppers, tomatillos and peas. I’ll have to install netting for them to climb onto. Meanwhile, I have planted seeds for carrots and onions and plan to add in beets and others. Those were failures in the sprouting-indoors experiment. I also plan to plant dahlias to bloom alongside the garden, and hide it a bit from the living room windows. But planting all of the garden was so exhausting that I’m delaying that till next weekend. I visited The Garden Corner nursery in Tualatin to look for hanging baskets to mimic the ones Rich loves from Switzerland. The problem is that I don’t know for sure what flowers they use. My photos of the Hotel Gletschergarden don’t resolve the mystery. So instead I searched for near matches. With the help of one of the staff, I decided on making up my baskets with a mix of orange and pink geraniums, verbena, and petunias. Those should give me blooms at three levels, and I think Rich was really after the color combination more than anything else. I made up my baskets, hung them, watered them, and sat back with wine and cheese for dinner. Ah, the good life.